永康街 Yongkang Street is a quaint little area in Taipei, located right smack in the city’s centre just next to 大安森林公園 Da’An Forest Park. It is a haven dotted with famous eateries, together with lesser known but no less interesting cafes, as well as some of my favorite pastry joints. We travel to this lovely city on a yearly basis and almost without fail, one day on our itinerary has to be allocated to exploring the intertwining little lanes and alleys for new foodie places we have yet to visit. Always full of surprises. 永康牛肉麺館 Yong Kang Beef Noodles is one of those beef noodles joints which had attained “celebrity class” status, and can be found in perpetually every other travel guide to Taipei. It has often been touted as the first to have anchored itself in this area to sell beef noodles, sharing the common ground of humble beginnings with other big names like the king of xiao long bao, 鼎泰丰 Ding Tai Fung. The latter still has their flagship store at the entrance of Yong Kang Street, but for us, we are here to have a bowl of authentic beef noodles. 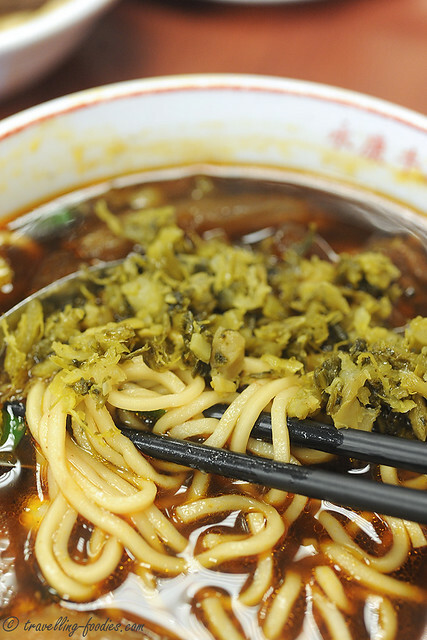 永康牛肉麺館 was started by a Mr. Cheng, who originated from 四川 Szechuan in China. Like many Taiwanese of that time, he followed the retreat of Chiang Kai Shek’s Kuo Min Tang army to Taiwan in the 1940s. Many of them were relocated and settled in living quarters specially set up for them called juan cun 眷村. Da’An Park Forest used to sit one of the largest of such relocation projects in Taipei. After relinquishing his military duties, Cheng sat up a small makeshift stall at Yong Kang Street selling beef noodles, bringing the familar flavours from his village back in China to his new home in Taipei. This proved to be much of a delight for many living in that area as many like him, came from Szechuan and longed for something to relieve much of their already escalating homesickness. When Mr. Cheng retired in the 1970s, the shop was taken over by a Mr. Luo, the current owner, and protégé of the old Mr. Cheng. Some appetisers we had before the noodles are being served. 滷豆干 Braised bean curd is a dish which we see a lot in the delis we have visited in Taiwan, be it noodle joints or Taiwanese porridge shops. At Yong Kang Beef Noodles, is it sliced and tossed with capsicum and chili, a perpetuation of the Szechuan cuisine theme which this shop is famous for. I especially like the drizzling of sesame oil which aid in elevating the aromatics of this dish, which definitely helped to work up some appetite. 红油抄手 is another signature Szechuan dish. Essentially they are meat dumplings wrapped with 餛飩 wanton skin, not unlike their Cantonese counterparts. What differentiates it from the other geographical varieties found throughout China is the use of chili and spices infused oil as a dip. Chillis, Szechuan peppercorns and other spices are thrown into a pot of preheated oil in which the hoard of ingredients are “fried” in before being left to cool, allowing their heat and spiciness to steep and permeate into the oil. It also lends the oil its fiery crimson coloration. At Yong Kang Beef Noodles, the chili infused oil is not drizzled on top as how the dish is customarily served. Instead, it sits at the bottom of the bowl with the dumplings laid over them. This allowed us to try the dumplings in their “original flavours” before a quick toss to amalgamate everything with the oil and indeed, they tasted really good. The skin was thin, unlike their 温州 Wenzhou counterparts. and the meat filling was quite substantial, unlike the crap we get back home in Singapore, succulent and very well-seasoned. The oil was however, a bit of a let down, as it was not as aromatic and fiery as I had anticipated. 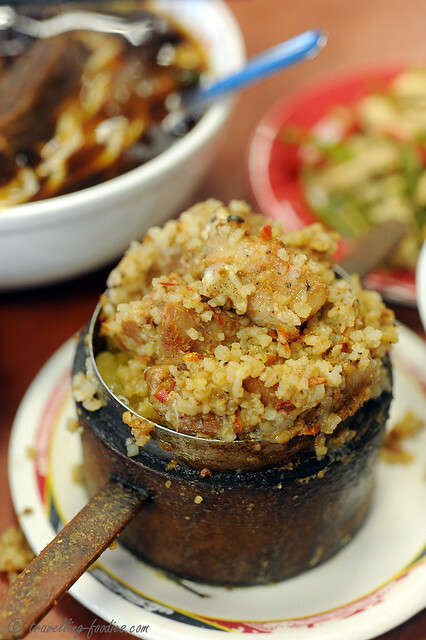 粉蒸排骨, a signature side dish at this shop. Chopped pork ribs well marinated and coated with a special rice concoction before being steamed at high heat. The pork ribs are very soft and smooth thanks to the rice concoction which had been crushed to the grain size of cornmeal. A good starter. 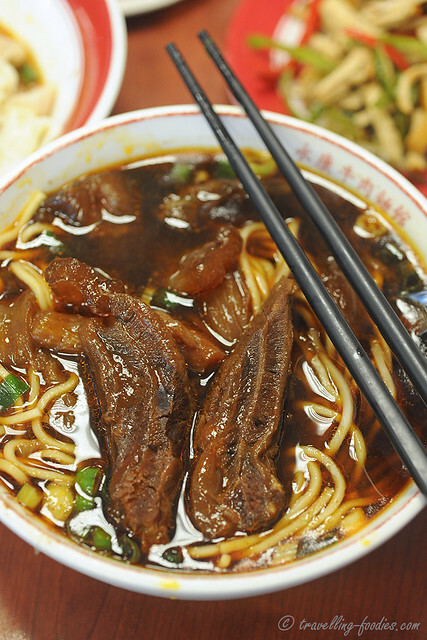 The signature of the shop, 红烧半筋半肉麺 Braised Beef Noodles with Beef Tendon. The beef stock soup base purportedly comes from a gigantic pot which has been boiling for eons, topping up with new batch of bones, and other condiments on a daily basis. As with many dishes from the 川菜系 Szechuan cuisine, the use of peppercorn amidst other spices and aromatics is the main highlight. The portion was huge, almost enough for two… well almost. Two generous chunks of 牛腱 beef shank with collagen-rich tendon sandwiched between the layers of meat, my favorite cut of beef. They are braised to right textural consistency, very soft but yet retaining a tad of bite. Tendon was very good too. Broth wise, I had expected it to be a tad more fiery, since it hails from Szechuan cuisine, famous for their 麻辣 pots. Old Mr. Cheng had handmade the 豆瓣酱 fermented bean paste which characterises the savory flavours of this dish from scratch during his time. I hope the tradition is still carried through to modern day. Not sure if the recipe had already been tweaked years back by Mr. Cheng to cater to the other veterans from other provinces (a lot came from Zhejiang) who are not accustomed to the heat typical to Szechuan cuisine, or have changes been made in recent times to suit the tastebuds of the local Taiwanese, and of course the hoards of Mainland Chinese and Japanese tourists the shop receives. For me, I had expected it to carry more oomph. Almost forgotten to add the important “side dish” available on the table, finely chopped pickled vegetables, which went very well with the noodles. It helped to cut through the robust flavours and any sense of “oiliness” from the broth. Option for thinner noodles also available but I personally prefer the “original” version which has more bite and importantly the “bouncy and springy” textures, often described as being “QQ” or “弹牙”. Being “hearty and wholesome” pretty much sums it up. On the whole, a very decent bowl of beef noodles indeed. But not as spectacular as what I had hoped for. This entry was posted on April 13, 2013 by Alan (travellingfoodies). 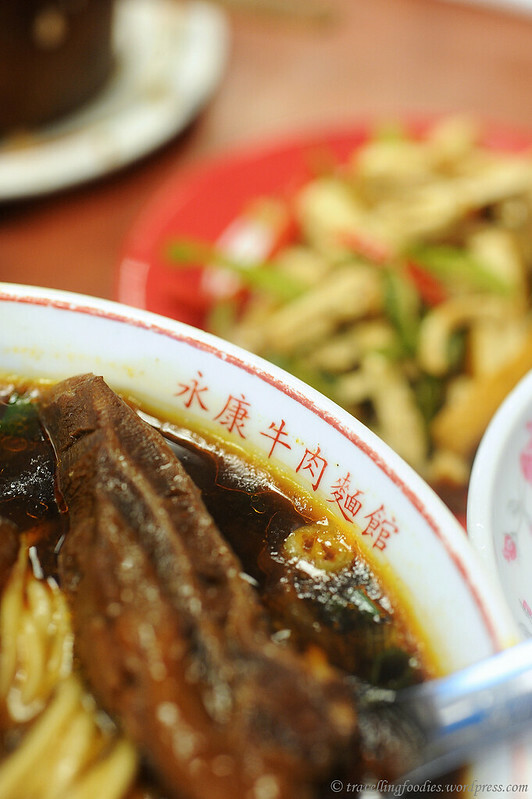 It was filed under Food, Travel and was tagged with Beef Noodles, 牛肉面, 粉蒸排骨, 红油抄手, 酸菜, Taipei, yong kang beef noodles, yong kang street, 半筋半肉, 大溪豆干, 永康牛肉面, 永康牛肉麺館. 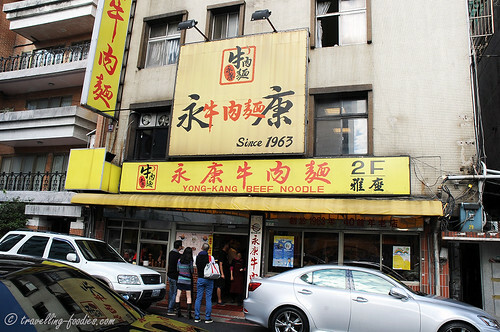 ooo but i really loved the yongkang st noodles i even went twice during my trip last year lol. if u find a better one do share! 🙂 i really miss the beef noodles there! did u visit la doucer too? they have pretty good cakes! yeah! 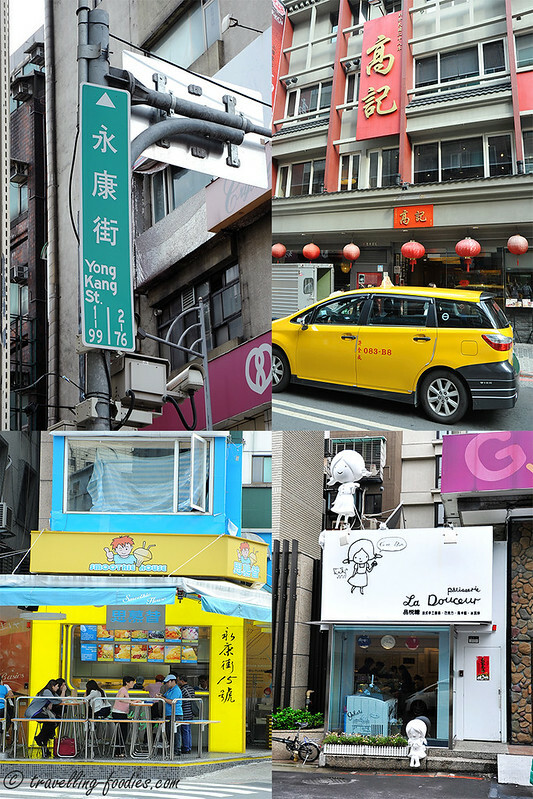 I would definitely love to try other beef noodle joints in Taipei. Try this beef noodles shop at Yonghe city.Take MRT to DingXi station.Look for the sign once u are out of the station.You can’t miss it! 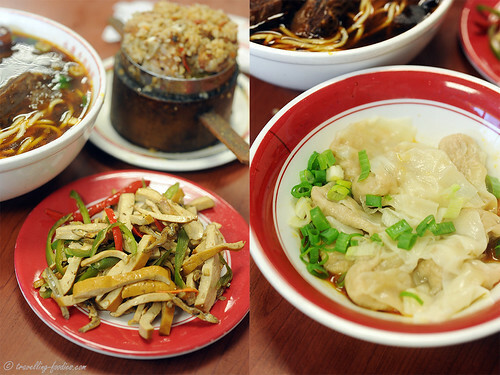 It’s called Lau Zhang beef noodle shop. Yummy if u have ever try them. I am visiting in late October, and I am planning to go there for lunch on a Saturday afternoon. What is the waiting time like? Upon arrival, can I queue, wait and finish the food within 1 hour? I have to attend an event in the late afternoon, and I cannot be late for it. I eat pretty fast lah, but I am just concerned with the waiting time. I will probably arrive at about 1pm.